Hamilton, Ontario - The owners of the Hamilton Tiger-Cats and the city are in a dispute over where to build a new stadium that would be the future home of the team and a venue for the Pam American games. The issue will now go into the hands of a facilitator. Team owner Bob Young called for a facilitator after the city rejected his call for a 90-day moratorium on submitting the west harbor location to Toronto 2015, the Games host corporation. He believes another location would be better for his team. The city approved a plan in February to build the stadium near West Harbor, but two weeks ago the Tiger-Cats publicly insisted that location makes it impossible for the team to break even. The football club would prefer to see the stadium near highway access points away from downtown, where it says it has a better chance of attracting private partners. The six-week extension to July 1 came with a caution that failure could mean the loss of the C$100 million to C$150 million facility. The two parties were supposed to indicate agreement on a site to Toronto 2015 by this week. The July 1 date was thrown out by moderator Nick Bontis and backed by a majority of those attending the discussion at the Hamilton Convention Centre. "July 1 would be a great target," responded Toronto 2015 CEO Ian Troop. Mayor Fred Eisenberger agreed, but Young and Tiger-Cats president Scott Mitchell wondered if that date is too optimistic. For a private-public partnership to work, Young said, requires that the private sector is engaged in the project. Troop said in an interview that there is general interest in the Games by the business community across the Golden Horseshoe, but it "would take something concrete so you can engage partners to look at the investment opportunities." Later, Troop said the host corporation is keeping a stadium fallback decision in mind in case Hamilton can't deliver. A home for the Tiger-Cats after hosting Games track and field has always been part of the Pan Am quest. But if it doesn't work in Hamilton, the Varsity Centre at the University of Toronto might be the Games' Plan B. It could be turned into a 15,000-seat stadium with temporary seating. And it is about 10 minutes from the athletes village, not the 45-minute trip Hamilton represents. Hamilton, Ontario - A landowner with property interests in the west harbor has offered an expanded proposal for the Pan Am stadium site that includes condos, luxury hotels and a stadium with a retractable roof, according to the Hamilton Spectator. Marino Rakovac has created a website that provides extensive details about the proposal, the newspaper reported. The plans, detailed at hamiltonbay.blogspot.com, include hotel and condo towers, a bayfront village with restaurants and shops, and a retractable roof on the stadium that "consists of four arch truss frames covered in synthetic fabric or solid panels." The proposal also includes walkways connecting the stadium to Liuna Station. Rakovac's website proposes the new stadium should be managed by the City of Hamilton, the Katz group - the company of Edmonton Oilers owner Daryl Katz, which has expressed interest in operating the Pan Am stadium - the Tiger-Cats and "perhaps others." The city and the Tiger Cats have been at odds over where a stadium should be built. The city and the football club have until Aug. 31 to reach an agreement. The team is backing a location on the east Mountain. Rakovac bought the property 13 years ago and had hoped to build a 150- to 200-unit condo complex on the site. However, as the area is zoned for heavy industrial uses, the property needs a rezoning to residential before those condos can be built. While the city supports the rezoning, The railroad that operates nearby, CN, says there should be no new homes within 300 meters of its tracks, it was reported. Downtown city council member Bob Bratina, told the Spectator that the city told Rakovac he needed approval from CN before they rezoned the area. Now, Bratina argues the city should rezone the land regardless of CN's position. Hamilton, Ontario - One of the proposed developers for a new stadium to host the 2015 Pam Am Games in Hamilton has pledged to meet the costs of building the venue above the C$110 million pledged by the province, city and federal governments, according to the Hamilton Spectator. The White Star Group wants to build the stadium on the city's west side while the Tiger Cats, which would be the venues long-term tenant, wants to build on the east side. White Star e-mailed a proposal to enter into an agreement with the city, the province, the Tiger Cats, and the Katz Group and AEG Management Group, which are involved in a pitch to control Copps Coliseum and the future Pan Am stadium. But Tiger Cats president Scott Mitchell said the football team "will never play at the west harbor." "I had a good laugh when I read (the White Star letter)," Mitchell told the Spectator. "I don't think they have any agreement in place. They never had a conversation with us." Tourism Hamilton executive director David Adames told the newspaper it was too early to tell if the proposal was a game-changer. Adames plans to call Marino Rakovac, head of White Star, to ask for details on where the funding will come from, what the leasing structure would look like and how Infrastructure Ontario would work in conjunction with them. The city and team have until Aug. 31 to reach an agreement on the Pan Am site, it was reported. Hamilton, Ontario - Officials of the 2015 Pan-Am Games are expected to move track and field events from Hamilton to Toronto, according to the National Post of Canada. Hamilton will host most of the event's soccer games, the newspaper reported. "It's going to be in Toronto - we're looking at a couple of options, finalizing some details there but that's probably where it's going to end up," Ian Troop, CEO of the 2015 organizing committee, told the newspaper. The news came after the Canadian Football League Tiger Cats said they have started the application process to bring an expansion North American Soccer League franchise to Hamilton. The team would play at a stadium in the East Mountain area - the location the Tiger Cats preferred for what would have been the Pan-Am track stadium - and a high-performance soccer academy would be established at the site, the Post reported. Hamilton is reviewing plans for a new stadium. One group wants to build on the city's west side while another prefers a site on the east. The Tiger Cats would be the primary tenant and its leaders have rejected a west side location. Team president Scott Mitchell also unveiled plans for a park featuring a cycling velodrome for the Pan-Am Games to be built at the West Harbor - where the city would like to build the stadium - along with a 3,500-seat amphitheater, the newspaper reported. The velodrome would be converted into a fitness center after the Games. Mitchell told the Post the park would not only provide a regional sports facility for both elite and recreational athletes, but would also allow for commercial and retail development. The city wants to build the stadium in the West Harbor location to revitalize the area. Troop said the Toronto venue for track and field could be either a new stadium or an existing facility. He added that organizers will not extend the Aug. 12 deadline for City Council to choose a stadium location, the newspaper said. A report on the financial viability of both sites is expected to be in council's hands this week, leaving time to study it before the council vote Aug. 10. Mitchell said both the soccer and football plans "are completely, 100 per cent contingent on this facility being built in the East Mountain." The Tiger Cats have noted several problems with the West Harbor proposal, including traffic issues. Meanwhile, the Hamilton Spectator said CFL commissioner Mark Cohon warned that if the Tiger Cats leave the city over the location of the proposed Pan Am stadium, "it will be the end of the CFL in Hamilton." Cohon's statement was included in a three-page letter he sent to city in which he urges them to reject placing the stadium at the west harbor and to back the Tiger Cats' desire to have the stadium built on the east Mountain, the Spectator said. Hamilton, Ontario - Hamilton's city council has decided on a stadium site on the city's west side against the wishes of the CFL Tiger Cats who preferred an east side location, according to The Spectator. The venue is also to be the site of some events in the Pan Am Games, but that, too, is in question. The city was left with no major tenant when Tiger Cats owner Bob Young backed out of stadium negotiations earlier this week. Now that the council has chosen a site opposed by the Cats, The Spectator said there are questions about how the city can convince the Pan Am Host Corporation they have a solid business case for the stadium. Mayor Fred Eisenberger, who has been the most vocal supporter of the west harbor, called the vote "bittersweet." "I don't think it is a victory until we have a stadium where we can get the Tiger Cats to play ... as well," he told the newspaper after the meeting. "We'll do our best to encourage them to come back to the table and talk about how we can make it work. That's what we're all interested in doing, but we're also all interested in getting a stadium at west harbor for all the right reasons." Pan Am CEO Ian Troop said in an email to the city reviewed by the newspaper that without the Tiger Cats, "whatever the recommendation coming out of council still needs to deal with the legacy picture." Troop emphasized that HostCo will consider the community sport uses, other "high performance sport" possibilities and the business plan that supports the viability of operating the stadium, the newspaper said. "I hope that council deals with these questions this week, and the plan council approves is clear on these areas," he wrote. Tiger Cats president Scott Mitchell told The Spectator the team is not interested in talking to the city any more. "When you ask if we'll come back to the table, for what?" Mitchell told the newspaper after the meeting. "Nothing has changed of any substance since their initial offer to us way back in February of a 15,000-seat stadium in the west harbor." Mitchell said it doesn't matter if the provincial and federal governments come up with the money to bridge the gap for building a full-size 25,000- to 30,000-seat venue. He said the west harbor site simply still won't work for the team from a business perspective. "At the end of the day, whether it's Bob Young or anybody else, no owner is going to own a team that they're convinced they're going to lose millions of dollars on. Nobody." Hamilton, Ontario - City leaders are talking about tourism deals, contributions towards the team operating costs and proposals to pay for tickets as potential deals to offer the Canadian Football League club if it will return to talks about playing in a new west side stadium, according to The Spectator. "I don't question that the west harbor is the best spot for the city," Councilmember Terry Whitehead, who voted against the west harbor site, told the newspaper. "But if we really believe it's the best site for the Tiger Cats, we should be prepared to put our money where our mouth is." But before the city can put these deals on the table, it needs to convince the team to reopen negotiations. Relations between the team and the city have been tense for several weeks. The Council voted last week to build the Pan Am stadium at the west harbor - a move that further distanced them from the team's position that it preferred the east Mountain site, which offered easy highway access and ample room for parking, but was considerably more expensive for the city. Several city council members say that after the high-stress events, both the city and the team need a few days to cool off. Many say they've been drained by the events of the past few days, the newspaper reported. Though no formal proposals have been made, the Spectator said one of the possibilities floated to entice the Cats to the west harbor was to guarantee a certain amount of ticket sales for every game. If ticket sales were short of that mark, the city would pick up the difference. Hamilton, Ontario - Hamilton City Council members are considering a new site for a 25,000- seat stadium that has been shunned by a CFL franchise and could be the home of events for the Pam Am Games, according to the Toronto Star. City staff are recommending a different location for the stadium directly beside the McMaster Innovation Park lands - a 51.29-acre CP rail yard. City manager Chris Murray said CP approached the city with an offer to launch discussions about the land. It's the latest in a string of three sites the city has considered since the end of August: the west harbor, the MIP lands on the east side of Longwood, and the CP yard. The staff report suggests a new deadline of Oct. 12 for staff to report back to the council. That Committee of the Whole and council meeting on Oct. 13 are the last two meetings before the Oct. 25 municipal election. The report also recommends staff approach the federal and provincial governments to ask for additional funding to build a larger 25,000-seat stadium. Currently, the funding on the table from all three levels of government will only fund a 15,000-seat stadium, a venue too small to house the CFL Tiger Cats. The Hamilton Spectator quoted Murray as saying it's better to forgo it altogether than build a stadium that's too small to house the Tiger Cats. He repeatedly emphasized that, without C$50 million to bump the stadium up to 25,000 seats, it won't be sustainable. Mayor Fred Eisenberger told the Spectator he was "doubtful" the new site would work and still prefers west harbor - especially because he says the additional costs at the CP lands could be in the neighborhood of C$100 million. Tiger Cats president Scott Mitchell told the Spectator the CP site "checks off a lot of boxes. "At first blush, it's worth exploring," he said. The Tiger Cats preferred a different location and walked away from talks with the city when the west harbor site was chosen. Officials with the Pan Am Games were also skeptical. In a statement, Pan Am CEO Ian Troop said "the evolving partnership between the city and the Tiger Cats and the selection of a site are positive steps forward. "We must resolve the situation quickly to protect the integrity of our venue plan," it read. Hamilton, Ontario - The province and the Tiger Cats have both agreed to make a greater investment in land needed to build a new stadium for the team and the Pan Am games on a site on the city's west side, according to the Hamilton Spectator. The move raises the hopes that a deal can be worked so the venue can be used for the 2015 games. The provincial government is willing to contribute extra money to bump up the size of the stadium and help buy the 53-acre CP rail yard city manager Chris Murray told the Spectator. And the Tiger Cats have agreed to purchase between 10 and 20 acres of the CP property which would be used to establish an entertainment/sports precinct, team president Scott Mitchell told the newspaper. "We've come forward saying we want to help with the capital investment and we'll work together to figure out that the best use of that land is long term," said Mitchell. The Ticats are also proposing to manage the stadium for the city while using revenue from naming rights and ticket surcharges to offset operating costs. Though the province and Ticats have stepped up to partner with the city, Murray did not say what that means in terms of hard dollars because discussions are still ongoing. But Mitchell told the Spectator that if the stadium goes forward, by the time the team moves in, owner Bob Young will have invested another C$15 million in the franchise, including purchasing his chunk of the CP lands. Additional money from all quarters is crucial because of the large funding gap. Right now, there are C$102 million public dollars available for the stadium, including C$45 million from the Hamilton Future Fund. Murray also told city council members that the city can only afford to build a bare-bones, "utilitarian" stadium to host the Pan Am Games. Currently it's "within grasp" to build a pared-down 22,000-seat stadium, Murray says. The Ticats need a 25,000-seat venue to replace the aging Ivor Wynne. That leaves a shortfall of C$25 million to C$50 million, not including the cost of purchasing and cleaning up the CP lands. CP has told the city that the price of the land has to include allowance for relocating its tenants, the newspaper reported. The city has hired an independent appraiser to estimate the value of the lands. Closing the funding gap is especially challenging because council member after council member has said they have no intention of raiding the Future Fund or tax levy for more money to boost the city's contribution. Mayor Fred Eisenberger also points out that a solution has to include redeveloping the west harbor, the aborted original site of the stadium, and the Ivor Wynne district. There are other hurdles ahead too. The Games' host committee is looking for a number of commitments from the council, including documents outlining risk assessments for the site such as local opposition and environmental remediation. More pressingly, they also want assurances that the funding shortfall has been bridged and the source of funds identified. Murray says Ian Troop, CEO of the host committee, is seeking the commitments because he will be updating his board of directors about the stadium shortly. Council will vote on the stadium site Oct. 12. Hamilton, Ontario - The CFL Tiger Cats have agreed to invest with Hamilton in a new stadium that will also be a part of the Pan Am Games, according to the Hamilton Spectator. "We can, and we will be, investing in the new stadium," team owner Bob Young wrote on the club's web site, adding the Tiger Cats want to help create enough economic activity to justify the city's investment. He did not detail how much the football club would contribute or if that contribution is tied to naming rights or other revenue sources. To this point, the club had offered only to buy and develop land adjacent to the stadium. A spokesperson for city manager Chris Murray, who has led stadium negotiations, told the Spectator the football club's financial participation and management obligations in running the stadium will be outlined to city council next week. But he warned getting the long-simmering stadium issue to the finish line is still challenged by a large funding gap. City Council member Lloyd Ferguson told the newspaper the city can't contribute more and needs help from the federal government and Toronto 2015 host corporation. The promise of money follows the call from the federal government for the football club and other private-sector parties to help finance a stadium that has grown in cost from early projections. The funding gap between the C$125 million three levels of government would provide and a bare-bones 25,000-seat stadium is C$35 million. And that doesn't include land acquisition, remediation and tenant relocation. Hamilton, Ontario - The CFL Tiger Cats say they're willing to invest C$10 million over 10 years toward a stadium in Hamilton, according to the Hamilton Spectator. The venue would also be used for the 2015 Pan Am games and event officials have given the city an "absolute and final deadline" of Feb. 1, 2011, to finalize all siting and funding agreements. The province remains willing to provide additional funding, but the federal government is noncommittal, noting that all three levels of government have already contributed $125 million. The city's capital contribution is $45 million. The final cost of the stadium is not known, depending upon how much money can be raised. The city has options to build a "bare-bones" stadium and one with more amenities. According to a draft letter of understanding with the city, the C$8 million to C$10 million commitment from the team is in addition to buying and developing 10 to 15 acres of the rail yard where the stadium would be built and contributing C$200,000 annually, through a ticket surcharge, to a capital reserve fund to be held by the city. The Tiger Cats have also agreed to operate the proposed stadium for the city, using naming rights, event parking and advertising revenue to offset costs. City manager Chris Murray told the Spectator the team capital contribution is a "significant" step in closing an estimated $41 million funding gap for a 25,000-seat facility. He hopes the commitment will now free up more support from senior governments. If the Feb. 1 deadline is not met, the organizers of the Pan Am Games say they will move the planned soccer program to a smaller venue in another municipality. "It's more of a brick wall than a deadline," Murray told the newspaper. Besides lobbying for more provincial and federal money, Murray says the city has a couple of other big hurdles to clear. The first involves intensive talks with Pan Am organizers and the province regarding the design of the stadium and clarifying any and all matters of concerns about the site. The second is negotiating the sale of the CP land where the venue is to be built and the cost of relocating the shunting yard and two existing warehousing and distributing businesses. Hamilton, Ontario - The Hamilton Tiger Cats are hoping to build a hotel, conference center, some townhouses and a sports-entertainment complex to go with the city's Pan Am stadium, making it a destination that will attract community users year round, the Hamilton Spectator reported. The funding and specifics for the stadium itself have yet to be finalized, with organizers of the Pan Am Games having set Feb. 1 as the final deadline for a proposal. The city and the team are working on a co-operative stadium package that has already seen the team commit C$8 to C$10 million, the city put in C$45 million and the provincial and the federal governments split a C$57 million contribution, for a total of C$110 to C$112 million - as much as C$53 million less than some consider the actual cost. The province has indicated it may increase its commitment, but by how much is not yet clear. Planning consultant Don May, a veteran planner involved with major public and private projects and the past president of Parks and Recreation Ontario, is working with the team and city staff to coordinate the stadium and its surrounding buildings in a village-style arrangement, including connections between existing trails and railway beds now in use at the site, which today is a CP marshalling yard, the newspaper said. The Tiger Cats would develop the hotel, conference center and other structures with private partners. The hotel and conference center would be targeted to co-ordinate with the nearby McMaster Innovation Park. May said the hotel would feature about 150 rooms in a structure up to eight stories tall, with the possibility of twinning the tower in the future. The plan would include sports-themed restaurants and a public square that leads onto the stadium itself, which would be situated at the west side of the site, close to Hwy. 403. May told the Spectator a possible block of townhouses would be designed to attract young buyers, helping to keep them in the city. Hamilton, Ontario - The Hamilton Spectator says two Toronto suburbs are taking a hard look at stadiums to replace Hamilton's Pan Am facility in the 2015 sports showcase. The mayor of Markham and a senior administrator in Mississauga told the newspaper their cities will begin sizing up the opportunity to deliver a 6,000-seat, C$40 to C$50million soccer venue for the 2015 Games. "Absolutely we are interested, recognizing Pan Am officials only have so much time to get these issues resolved and facilities built," Markham Mayor Frank Scarpitti told the Spectator. He said soccer is very big in Markham "so it's a good fit for us. But we need to do our due diligence." Scarpitti said his city recently bought a 100 acre parcel of land for sports facilities and a soccer stadium might be part of a plan at that location. Markham already is planning a 50 meter pool as part of the Games program. John Rydzewski, who runs Mississauga's Hershey Sports Centre, said the request from the Games host corporation TO2015 will reboot a previous study of a soccer facility. "We had looked at a number of sites for a similar project so we will reactivate that. I'd say we can satisfy that criteria but we have to do a business analysis and report to city council," he told the Spectator. The newspaper said TO2015 wants firm expressions of interest in the backup plan by Dec. 15. Oshawa and Brampton were also approached by TO2015 and asked if they wanted to prepare contingency plans. Oshawa Mayor-elect John Henry told the newspaper he would not push for his city to make a proposal as it has already started on a soccer complex and it is too late to accommodate a 6,000-seat facility. The Spectator said Hamilton faces a funding gap of at least C$50 million for a 25,000-seat facility at the CP Rail lands in the city's west end and there are no saviors in sight. The federal government has declined to put up any more money and the provincial government hasn't specified an amount. The Pan Am stadium was conceived on the basis of the legacy partner, the Hamilton Tiger Cats, and its private-sector partners coming up with C$50 million toward the project. The Tiger Cats have pledged C$8 to C$10 million and recently announced plans for a hotel/conference center/sports entertainment development adjacent to the stadium. Hamilton, Ontario - The Hamilton Spectator says a Burlington Pan Am Stadium consortium has proposed a C$90 to C$120 million stadium for Aldershot that would not require a municipal contribution from the City of Burlington. That was the offer Tiger Cat president Scott Mitchell and consortium partner Angelo Paletta made to Burlington Mayor Rick Goldring in a 90-minute private meeting, the newspaper said. �We have tried to give them a compelling business case," he told the Spectator. �What we are proposing involves no financial contribution from the City of Burlington." The Spectator said Burlington appears ready to play ball. �How can we not look at this?" Goldring said afterwards. �They have come with an offer we can't refuse to look at." The proposal depends on the Pan Am organizing committee providing C$70 to C$100 million in funding that was to go to a Hamilton stadium, before Hamilton council ran out of sites. Asked why Hamilton would be asked for C$45 million for a stadium and Burlington might get there without any contribution, Goldring said it was his understanding there were bigger challenges involved with some of the other Hamilton sites. The huge sweetener comes from Paletta, who told the mayor and city staffers that the stadium would be the catalyst to kick start more than C$100 million in development on the adjacent 125 acres of land he owns, the Spectator reported. Paletta, who is the key figure in the Burlington consortium, is offering the private land as part of its portion of a $30 million contribution for the project, said the development would include a hotel, restaurants, retail and a training center for sports excellence. The Pan Am host committee has insisted the stadium site must be settled by Feb. 1. The Hamilton council is expected to revisit recommending Confederation Park as the stadium location when it meets again, the newspaper said. In an emergency session just before Christmas, Hamilton's city council voted 9-6 against a proposal to explore building a stadium for the 2015 Pan American Games on lands the city owns at Confederation Park along the shores of Lake Ontario, according to Toronto's Globe and Mail. Burlington, Ontario - Burlington officials have voted to pursue a deal for a new stadium that would host the Pan Am Games in 2015 and the CFL Tiger Cats, but they agree that if Hamilton resolves its stadium development issues by Feb. 1, they could be left on the sidelines, according to the Hamilton Spectator. That could happen. Hamilton officials this week agreed to study the possibility of virtually razing and rebuilding the 81-year-old Ivor Wynne Stadium to meet the team's needs. "This is not the best solution for us," Tiger Cats owner Bob Young told the Spectator. But he added it's one the team is willing to work with. The Toronto Globe and Mail said Ivor Wynne had been initially dismissed because Young wanted a high-visibility site near a highway. The council voted to have city staff review the plan's feasibility, a process that will take a dozen officials to pull off in time to meet deadline. Staff members will also investigate a site on the city's west harbor. Meanwhile, both cities face a Feb. 1 deadline from the Pan Am organizing committee. "Should the municipality of Burlington wish to submit a proposal for the larger CFL venue, it will be evaluated using the same standards, criteria and deadline as applied to Hamilton," Ian Troop, chief executive officer of the Pan Am organizing committee, said in a statement. Troop said Hamilton "is still in the driver's seat" for the stadium. The Spectator said Troop made it clear to what would be required from Burlington. "When we talk about a proposal, we're not talking about a loose outline of a concept idea. We're talking about specifics on location, the remediation issues, full financing, what it will cost to build a stadium, how they will pull that money together, the definition of what the (amateur sport) legacy will be." Ontario cabinet minister Sophia Aggelonitis, who represents Hamilton Mountain, reiterated the Feb. 1 deadline is real. "My understanding is the Feb. 1 deadline is firm," she told the newspaper. "While Burlington and other communities are looking at trying to host a Pan Am stadium, at the end of the day it is still Hamilton's choice and I'm optimistic there is going to be a Hamilton solution." 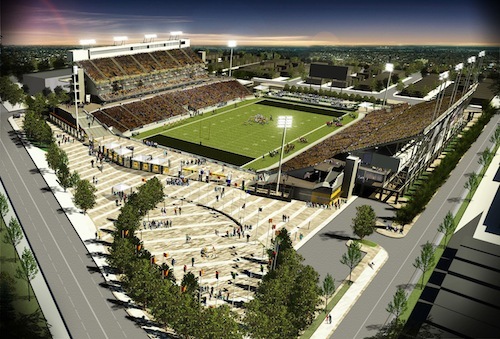 For Burlington, the lottery is a C$90 million to C$120 million Aldershot stadium that would serve as the future home of the Hamilton Tiger Cats and jump-start more than C$100 million in adjacent commercial development. The kicker: Burlington taxpayers won't have to contribute anything. No requirement for capital costs and the private Burlington consortium featuring the Tiger Cats and local developer Angelo Paletta would assume all construction risks and stadium operating costs. The Burlington vote calls for city staff complete a preliminary analysis of the Pan Am "opportunity" and report back on Jan. 18. Hamilton, Ontario - A recently proposed plan to replace Hamilton's Ivor Wynne Stadium with a new venue to host the CFL Tiger Cats and the upcoming Pan Am Games could be costly, according to the Hamilton Spectator. A new report reviewed by the newspaper said the cost of building a stadium at the west harbor would cost C$6,800 per seat; at East Mountain, C$7,300 per seat; at the CP rail yards, C$6,400; and renovating Ivor Wynne, C$9,200 per seat. However, the final cost estimates - which peg the cost of overhauling the east-end stadium at C$159.1 million - leave the city with a funding gap of C$38.6 million. City staff are now looking to the province to step in with more funding and will report back to council with their progress. The Spectator also quotes sources as saying the cost of renovating the stadium will be less than the estimated C$159.1 million, putting the gap at about C$10 million. A detailed report on the plans will be released this week. City Council member Lloyd Ferguson, who came up with the per-seat estimates, told the Spectator part of the reason the cost of renovating Wynne stadium is so high is that Infrastructure Ontario is the one coming up with the estimates. Infrastructure Ontario, the province's arms-length construction agency, is the organization that will lead the stadium rebuild, including tendering and hiring the contractors. Ferguson - who is a former construction industry executive - said IO is notorious for building large contingencies into its estimates, which inflates the costs. "It's been my experience that IO projects never go over budget because their estimates have way too much cushion in them," he said. He said Hamilton approached IO and asked if the city could run the stadium renovations itself in order to control the costs. But IO said no. Ferguson added the city did not see a detailed breakdown of IO's estimate, so they're unable to tell where it came up with its numbers. Another reason why the Ivor Wynne renovations were expected to be less was due to information council received in a city report from 2009. At that time, the cost of demolishing and rebuilding the stadium was estimated at between C$98 million and C$100 million, the newspaper reported. However, that report didn't factor in many of the amenities that are required for a Pan Am stadium, Diane LaPointe-Kay, the city's director of recreation, told the Spectator. The new estimate from IO includes the cost to add soccer facilities, changing rooms, coaching facilities and warm-up areas, as well as facilities for community use. Hamilton, Ontario - The Hamilton City council has voted unanimously to name Ivor Wynne stadium as the location of the 2015 Pan Am Games. The council also voted to adopt a draft memorandum of understanding with the Hamilton Tiger Cats that outlines the terms of the team's 20-year lease with the city, according to the Hamilton Spectator. The decision resolves a divisive and often-heated debate that has dominated discussions at City Hall since May 2010, when the Cats said they would not support a Pan Am Games stadium at the west harbor. It also marks a point of no return. If the city chooses to back out of the Games after this point, it could face legal liabilities. It's now up to the games' CEO Ian Troop to review Hamilton's plan and rule whether the city will be awarded the stadium. TO2015, which lined up fallback options for the stadium in other municipalities, will announce its decision in mid-February. The team has agreed to pay C$450,000 in rent a year for football games and has offered another C$150,000 per year to use the stadium for soccer. The Cats have also agreed to guarantee the city C$9 million in naming rights, 10 percent of the team's net income after four years, and 50 percent of offsite parking revenues. The city will also receive 25 percent of luxury suite rental revenues above C$4,000. The Spectator said a last-minute financial injection from the provincial government has erased Hamilton's funding gap for the stadium. The province, which had already contributed roughly C$35 million to Hamilton's Pan Am stadium, will give the extra C$22.5 million directly to the city instead of passing it along directly to TO2015. That means the city will still be able to maintain the 44 percent share of the costs it has agreed to carry and won't put the province's share out of balance. The federal government is not contributing anything above the C$35 million it has already pledged to the project. It will be fall 2012 before any construction begins on a new stadium in Hamilton, Ontario, the Hamilton Spectator said. To accommodate the Tiger Cats game schedule, the entire project � from demolition to construction � will take place within one CFL season. HAMILTON, ON, Oct. 12, 2012 /CNW/ - Hamilton's storied Ivor Wynne Stadium will rise again as a state-of-the-art sport legacy to Steel Town, the sole host of soccer competitions during the upcoming TORONTO 2015 Pan Am Games, officials confirmed today. The brand new $145.7-million stadium, renamed Hamilton Pan Am Soccer Stadium at Games time, is jointly funded by the Government of Canada, Province of Ontario and the City of Hamilton. 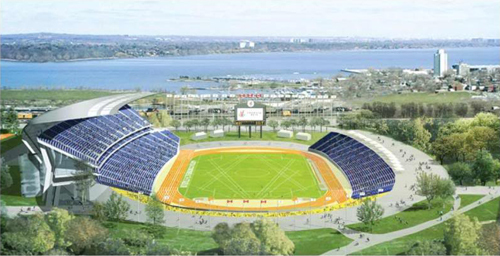 It will open in July 2014�a full year before Hamilton hosts all 32 men's and women's soccer games during the TORONTO 2015 Pan Am Games. The overall project costs for this facility are anticipated to come in at $145.7 million. Of the $145.7 million, $119.1 million is the amount to design, build and finance the project. The remainder is comprised of capital expenditures for equipment, transaction fees, project management and other ancillary costs. It is on budget and construction is starting on time. The new stadium will be built on a 5.45-hectare parcel in Hamilton's Stipley neighbourhood where the venerable Ivor Wynne Stadium currently stands. The design reimagines the historic site�fittingly, the same ground where Canada held its first major international competition, the British Empire Games in 1930�as a flexible "neighbourhood stadium" that can host professional and amateur sports, cultural happenings and prestigious national and international events. "In almost a thousand days, Hamilton will welcome some of the world's top soccer teams to compete in Canada's newest and most modern stadium," said Ian Troop, Chief Executive Officer of the Toronto 2015 Pan Am/Parapan Am Games Organizing Committee (TO2015). "As the sole Pan Am venue for the world's most popular sport, the Hamilton Pan Am Soccer Stadium will be the focus of some of the most intense interest and passionate spectators we'll see in 2015 and this showpiece legacy venue will help ensure the city shines." To maximize flexibility, the stadium's footprint has shifted 90 degrees to a north-south axis in line with international standards, and a striking sun-lit pedestrian plaza has been added to encourage residents and sports fans to come together to celebrate big games and cultural events. It also meets the highest standards for accessibility and the most up-to-date technical requirements of the Canadian Football League (CFL) and the F�d�ration Internationale de Football Association (FIFA), including all-new FIFA-approved artificial turf. "Ivor Wynne Stadium has served Hamilton and its residents for over 85 years but it's time for a new facility to capture the imagination of the city, its sports fans and its athletes," said Hamilton Mayor, Bob Bratina. "With this design, we're creating a stadium our community can use year-round and sets Hamilton up to attract national and international events that will boost the city's tourism and economy as a whole." The modern and airy stadium will have a solid masonry base topped by a white steel exoskeleton with permanent seating for 22,500 spectators and the ability to expand to up to 40,000 seats for major events. It will have fantastic sightlines and first-class amenities, such as 30 club suites, six elevators, bigger seat sizes, updated press and broadcasting facilities, as well as concession stands on all levels. With the new north-south alignment, players and spectators will also have a jaw-dropping view to the south of the 90-metre-high slope of the Niagara Escarpment, a UNESCO World Biosphere Reserve, known locally as "The Mountain." Wind and sun shading on the field-of-play will also be greatly reduced and allows light into homes along Beechwood and Balsam avenues. The current 84-year-old Ivor Wynne Stadium will be demolished in December following the end of the Hamilton Tiger-Cats 2012 Canadian Football League (CFL) season. Construction is slated to start immediately after the site is cleared. "The Government of Canada is a proud supporter of the 2015 Pan and Parapan American Games, which will bring economic prosperity and job creation to the region, the province and our country as a whole," said the Honourable Bal Gosal, Minister of State (Sport). "As a result of our Government's contribution to the Games, our talented amateur athletes will have the opportunity to compete in state-of-the-art facilities as they take on the Americas in 2015." Infrastructure Ontario recently announced the hiring of Ontario Sports Solutions (ONSS) as the consortium in charge of the Hamilton project. The consortium consists of developers and constructors Bouygues Building Canada Inc. and Kenaidan Contracting Ltd., as well as the design team of Cannon Design, FaulknerBrowns Architects and Arup Associates. "The McGuinty government is proud to be bringing the 'People's Games' to Hamilton, boosting the local economy with new jobs in construction and tourism," said Charles Sousa, Ontario Minister responsible for the Pan and Parapan American Games. "This new state-of-the art stadium will be a tremendous legacy for the community to enjoy for generations to come." The soccer stadium in Hamilton is part of a previously announced construction bundle for the TORONTO 2015 Pan Am/Parapan Am Games, which also includes the velodrome in Milton and an athletics stadium at York University in Toronto. The Hamilton stadium will reach a Leadership in Energy and Environmental Design (LEED) rating with its site selection, reduced greenhouse gas emissions, waste diversion and recycling, and the efficient use of energy, water and other resources. Last spring, TO2015 announced the cluster and sport program for the TORONTO 2015 Pan Am Games. At that time, it also announced details of the budget for both Games. TO2015 will issue quarterly budget updates starting this fall. The Pan American and Parapan American Games are one of the world's largest international multi-sport events, held every four years for athletes of the 41 member nations of the Pan American Sports Organization (PASO) and 26 member nations of the Americas Paralympic Committee (APC).� The Pan American Games are comprised of all Olympic Summer Games sports, as well as traditional Pan American sports, while the Parapan American Games are comprised of the majority of Paralympic Summer Games sports.� The TORONTO 2015 Pan American/Parapan American Games will draw more than 10,000 athletes, coaches and team officials and feature 51 sports in municipalities across the Greater Golden Horseshoe area. The TORONTO 2015 Pan American Games will take place July 10-26 and the Parapan American Games August 7-14.